Out of all of the tools we have at our disposal in modern veterinary medicine, digital radiography is one of the most valuable. At Nordhoff Veterinary Hospital we strive to offer the highest quality medicine and diagnostic testing, and thus are proud to offer digital radiology services to our patients. A radiograph (also known as an x-ray) is a type of photograph that is used to observe internal organs including the heart, lungs, liver, kidneys, stomach, and intestines, as well as the patient's skeleton and individual bones. We can use these observations to determine the state of your pet's internal health. One of the main benefits of digital radiology is the ability to view results almost instantaneously. This allows us to very quickly make diagnoses and begin treatment. It also allows us to speedily consult with specialists on your pet's case when needed. Radiology uses only low doses of radiation and is therefore considered very safe. In fact, because the radiation exposure that your pet experiences is so low, even pregnant females and very young puppies and kittens can can be x-rayed safely. Radiographs are often used to evaluate the health of your pet's individual bones or sometimes, his entire skeletal system. If your pet appears to be in pain, a radiograph may reveal arthritis, malformation, or a break or fracture. Sometimes, Dr. Popescu will order x-rays to view the size, shape, and any abnormalities of a specific organ. An enlarged heart, intestinal blockage, or bladder stones are just a few of a variety of conditions we may use radiographs to detect. 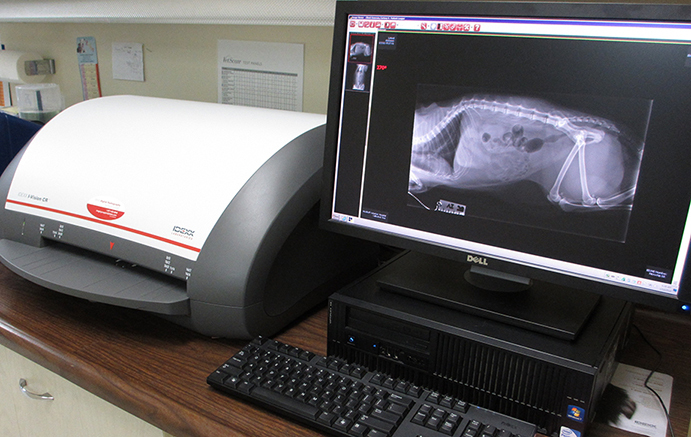 Digital radiology is a very important component in our diagnostic toolbox, and integral to providing you and your pets the most complete and state of the art care possible.